Shurtape P724 console label tape is made from a type of paper referred to as “kraft”. Kraft paper is stronger than lots of other papers because of a manufacturing process that removes one of the components of wood pulp that negatively impacts paper strength. By removing most of the lignin in the manufacturing process, the paper becomes stronger. 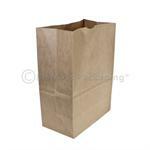 The best known use for kraft paper is making shopping bags. In order to make the paper the bright white which is prized as a characteristic of console labeling tape, it is bleached while still in the pulp format.